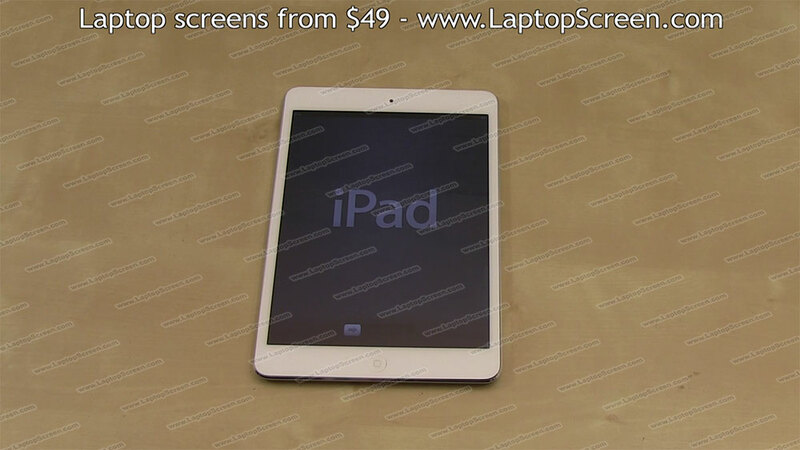 This guide will show you how to install your iPad Mini LCD screen and front glass digitizer. 1. The first thing you'll need to do is to turn off the iPad Mini. The device can be powered down by holding the power button on the top and then confirming the shutdown on the screen. 2. 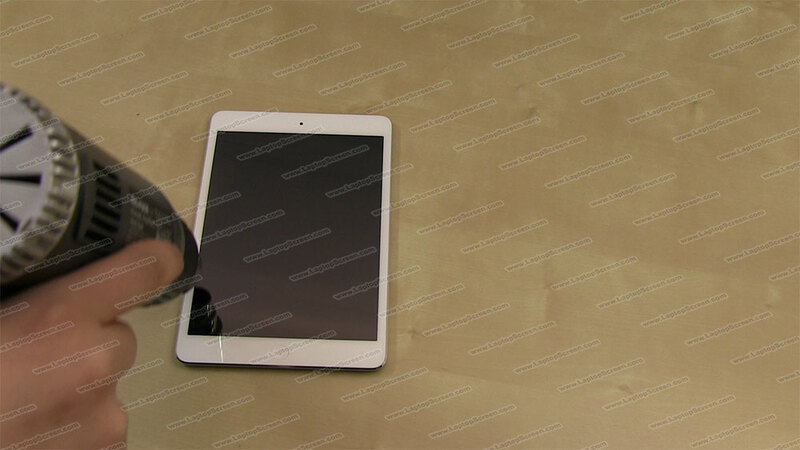 The front glass, which is the touch sensitive digitizer, is glued on. Removal of the digitizer will require some heating prior to opening. It is also recommended that you use a suction cup for keeping the aluminum edges ding-free. 3. Using the heat gun, warm up the glue on the edges of the front glass. Be consistent, ensuring that the heat is evenly distributed. If heat is applied to one spot for too long, further damage or cracking to the glass or LCD screen may occur. 5. 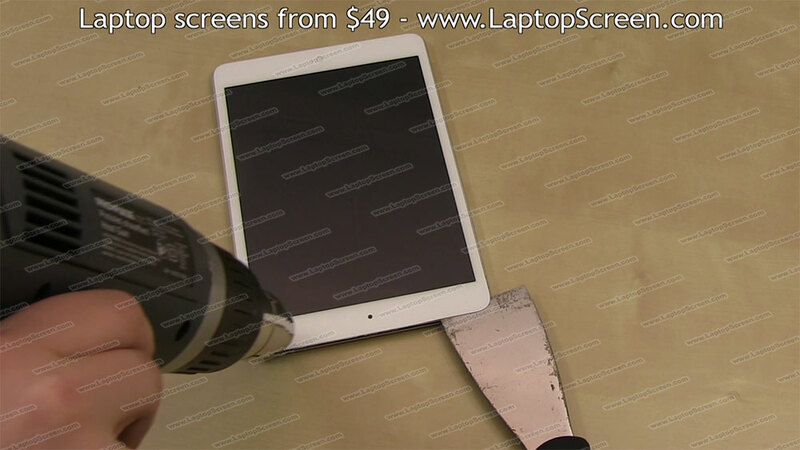 Work your way around the top edge, using the putty knife to separate the digitizer from the frame. It is advised to keep applying heat from the heat gun in order to keep the glue warm. 6. After some amount of separation has occurred, place plastic strips between the front glass and the LCD so that the glue does not adhere again. It is also useful to use a plastic pick to keep the glass panel open. It is not advised to use a screwdriver in place of the plastic strips or pick - unless your glass is already broken - as further damage to the glass may occur. 7. 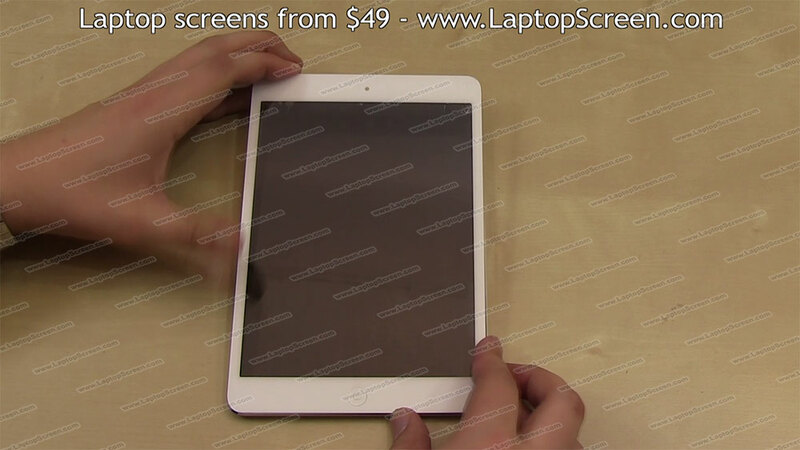 With the top edge separated, you can now use your fingers to pull up the touch sensitive digitizer glass. Leverage the bottom edge of the glass. Continue with the separation process by applying heat using the heat gun on the left, bottom and right edges. Keep the heat gun moving, taking care not to leave the heat in one spot for too long. 8. Lift up the digitizer glass, but do not separate it from the bottom, as it is still connected. 9. Now we will proceed to remove the LCD panel. If your digitizer is still intact, and you will simply be replacing the original one again, hold it at no more than a 90 degree angle to the surface. 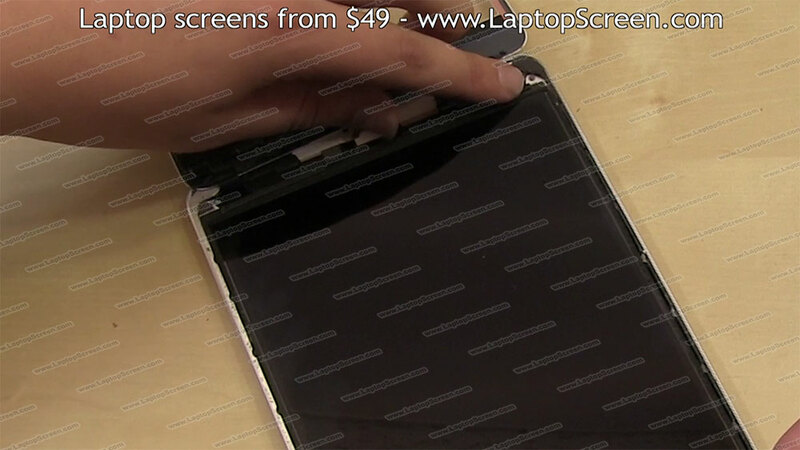 If the digitizer is broken and you will be replacing it with a new one, it is not necessary to hold it up. 10. 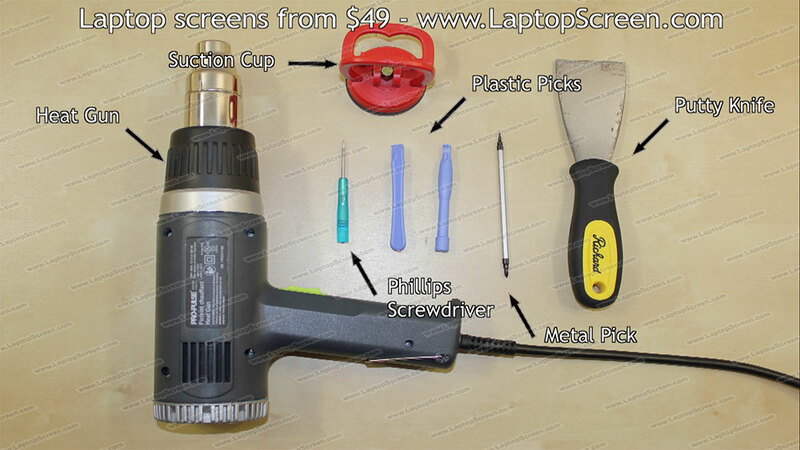 There are 4 LCD screws which will need to be removed. 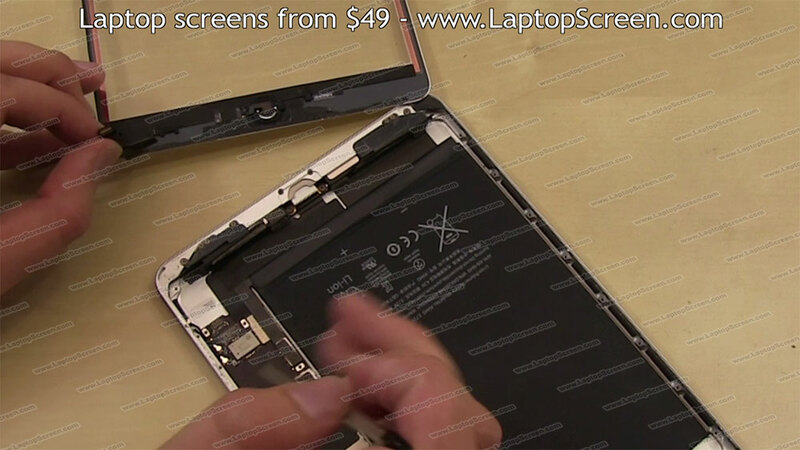 There is one LCD screw in each corner. The final one is obstructed by foaming insulation. 11. Using the putty knife, gently lift the LCD screen from the top, while keeping the bottom edge down. 12. A metal separator plate is secured with 16 tiny screws - 8 on each side - which will need to be removed. Start by removing the 8 identical screws from the left side, followed by 2 larger screws and then the 6 tiny screws on the right side. 13. The metal separator plate can now be removed. 14. With the metal separator plate removed, you'll see there is another smaller one under it. This smaller metal separator plate will need to be removed in order to disconnect the LCD screen and the digitizer. Remove the 3 screws from the metal separator plate. 15. Above where the metal separator plate was located, you will see there is an LCD connector, which will need to be picked open. 16. The digitizer's connector is located underneath. You can now pick open that one as well. 17. Lay down the LCD screen and you will see that it is connected via 2 pieces of black tape. Using a pick or a flat-head screwdriver, gently remove these pieces of tape, which are holding the LCD in place. 18. There is a control circuit that is glued in. You will need to remove it with a pick or flat-head screwdriver. 19. 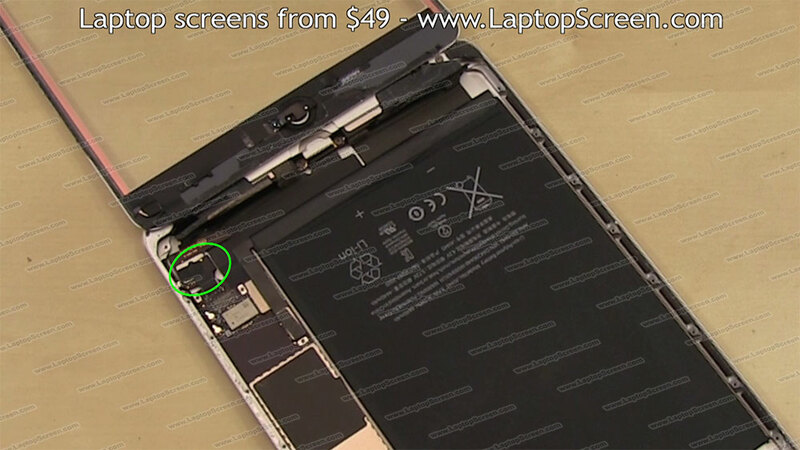 After the control circuit has been removed, you can set the glass digitizer aside. 20. 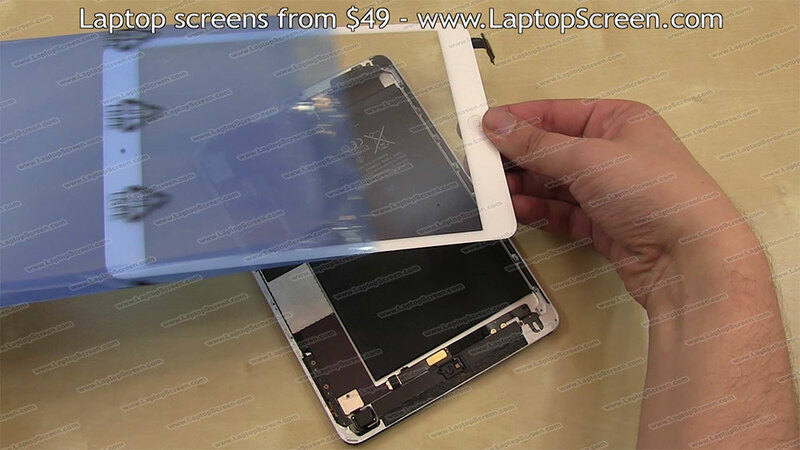 The iPad Mini can now be reassembled using a new or original LCD screen and digitizer. 21. 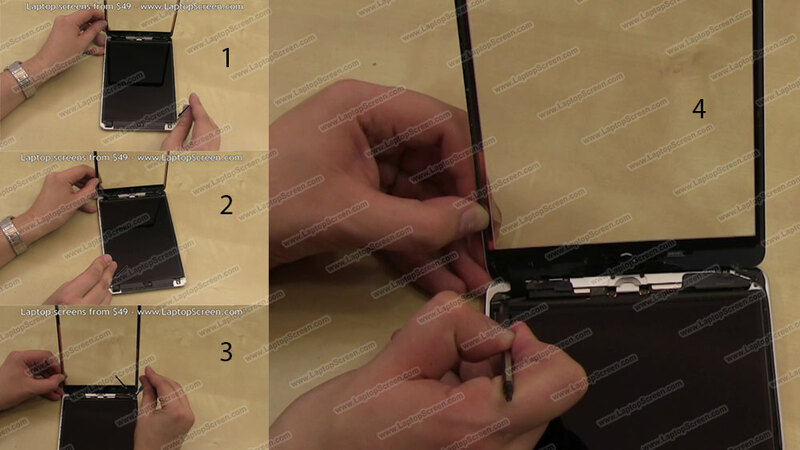 Align the glass digitizer with the bottom edge of the iPad mini, guiding it in to position and re-connecting it to the logic board. 22. 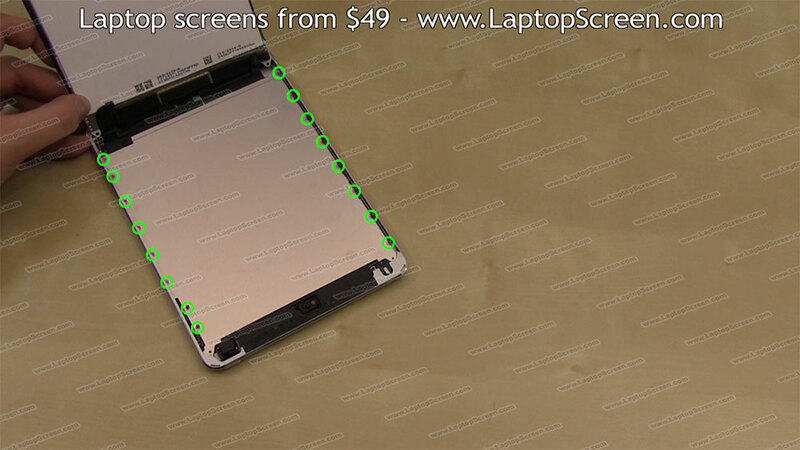 Re-connect the LCD screen to the logic board, aligning it with the bottom edge. 23. 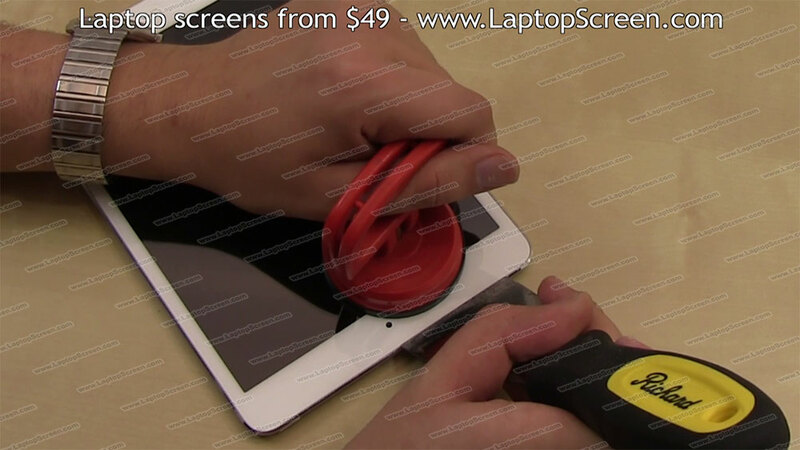 Gently place the LCD screen down and re-apply the mounting tape. 24. Lift up the LCD screen. Replace the small metal separator plate using the 3 screws. 25. The large metal separator can now be replaced. Put in the 2 larger screws first. 26. Next, the 14 tiny screws can be replaced. 27. The LCD screen can now be placed down on top of the metal separator. Replace the 4 screws - 1 located in each corner. 28. If you needed to replace the glass digitizer or LCD screen with new ones, you will need to remove the protective film at this point. 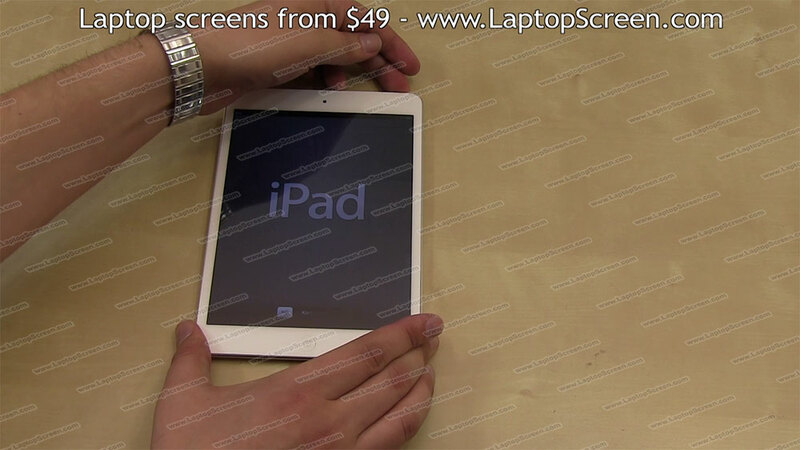 Use a dry, lint-free cloth to remove any dirt, smudges or fingerprints from both the LCD screen and the glass digitizer. 29. After you have ensured that all surfaces are clean, place the digitizer on top of the LCD screen, checking that it is properly aligned. 30. 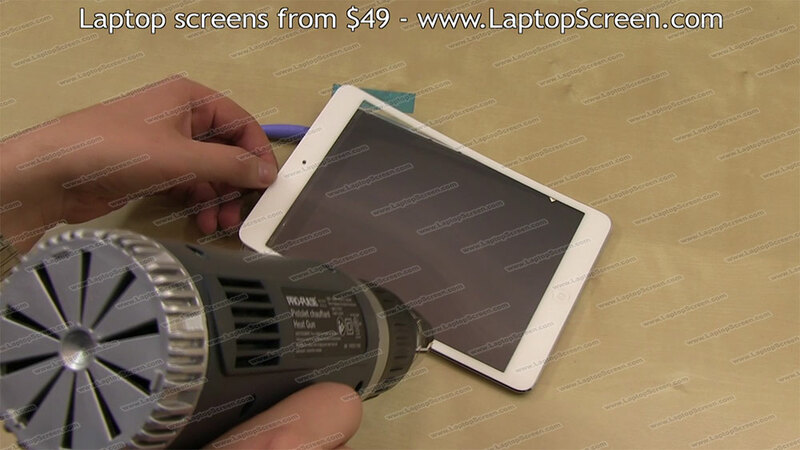 Use the heat gun to warm the adhesive on the edges of the iPad Mini. 31. 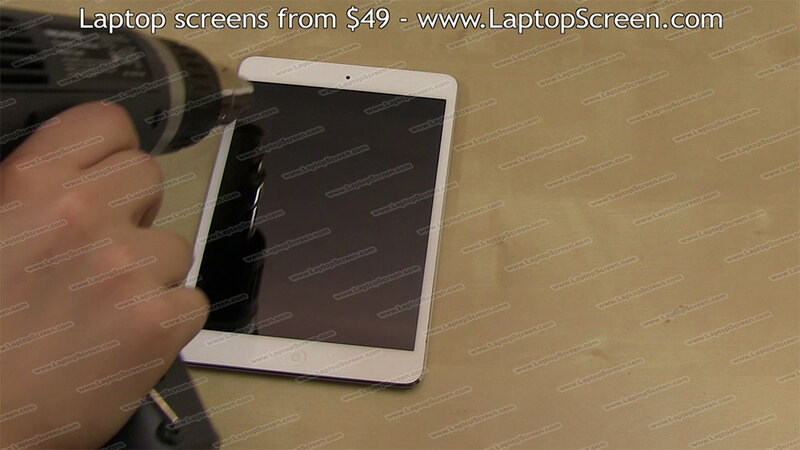 Then, using a paper towel, gently shift the digitizer back in place. 32. The process is now complete, and you can turn on the iPad Mini! Some of the glass digitizers (top glass part of screens found in tablet and smartphones) sold by us may be classified as after-market replacements. Such items are produced by third party manufacturers and are individually hand picked by us to be of highest quality, to meet all reference specifications, and to be fully compatible and to work as plug and play direct drop-in replacements. The high quality aftermarket replacements are covered by our standard warranty. They have not been manufactured by OEM manufacturer and there are no original manufacturer's logos or trademarks on the item.